noun: A prison or a prison-like place or situation. After Newgate, an infamous prison in London, in use since the 13th century, rebuilt many times, and torn down in 1902. The prison is so-named because originally it was located on the site of Newgate (a gate in the Roman London Wall). Earliest documented use: 1592. The prison also had people come in for minor crimes, such as murder. For example, Ben Jonson, playwright and poet, got in for killing a man in a duel, but was released after reciting a Bible verse. 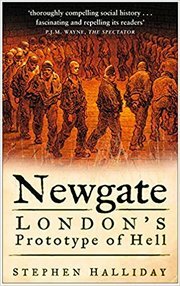 Newgate was a private prison, so inmates had to pay for everything: room, board, getting shackled and getting unshackled, and so on. Often, they were double-billed, but that may have been due to computer errors. Software was not as reliable in the 13th century. Because running prisons for profit is such a humane thing to do, we have private prisons, even in the 21st century. Check out this report of an undercover investigation of a private prison. Alan S. Bell (ed. ); Lord Cockburn: Selected Letters; Birlinn; 2005. See more usage examples of newgate in Vocabulary.com’s dictionary.